Renew your catalog of coloring games with Rango Coloring Game! The unforgettable turncoat enslaves hearts! 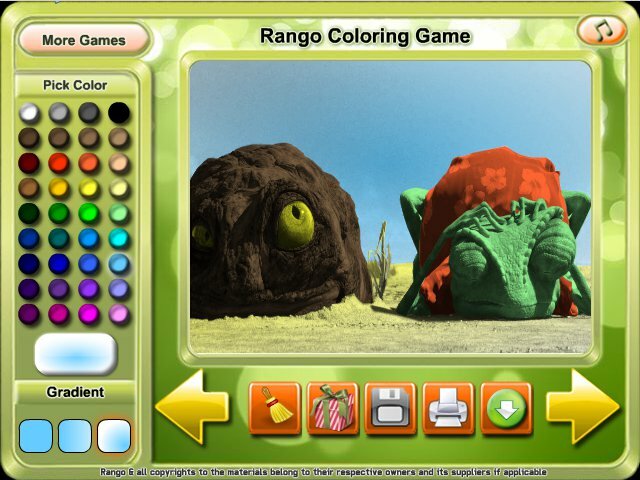 Therefore you\'ll not be upset playing Rango Coloring Game and delighting the attractive scenes from the film! One tiny valiant resists the whole brigandish gang! We have brought the thrill-seeking Rango in the new Rango Coloring Game! Now you can spend as much time as you like with your beloved valiant and color him and his everyday life! Sounds captivating, doesn\'t it? Download Rango Coloring Game and be carried away! Just provide yourself with your virtual magic marker and have thrilling coloring time! Explore a magical world filled with puzzles and adventure, meet and interact with other characters and creatures, and unravel a mystery that is threatening Wonderland's existence.